We communicate most expressively through our eyes, the “windows to the soul.” Unfortunately, aging eyes can significantly impact your appearance. Instead of looking rested, alert, and energetic; drooping eyelids, puffy eye bags, dark circles, and wrinkles can make us look tired, run-down, unhappy, or even angry. No matter your concern, we have multiple strategies to help you refresh your eyes. The upper lid blepharoplasty is a safe outpatient surgical procedure for improving heavy upper eyelids. Through a strategically placed incision, this technique involves removing excess skin and fatty tissue that weigh down the eyelid. Because this incision is placed in the natural contour of the upper eyelid, the incision is camouflaged after healing. Blepharoplasty is performed under local anesthesia for your safety. During your consultation, your physician will review pre-operative requirements and post-operative expectations. Although bruising and swelling may occur, most patients are able to return to non-strenuous activities in approximately one week. Upper lid blepharoplasty is often performed in conjunction with laser resurfacing. This eliminates virtually all potential scarring and offers greater skin tightening and eyelid lift. 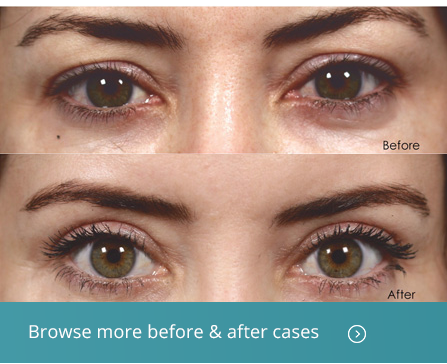 The lower eyelid blepharoplasty procedure helps reduce lower eyelid bags. This technique involves removing excess skin and fatty tissue through an incision made just under the lower lash line or inside the lower eyelid. It may be combined with a canthopexy to tighten the lid further, if needed. Blepharoplasty is considered an outpatient surgery and is performed under local anesthesia for your safety. During your consultation, your physician will review pre-operative requirements and post-operative expectations. Although bruising and swelling may occur, most patients are able to return to non-strenuous activities in approximately one week. Lower lid blepharoplasty is often performed with laser resurfacing. This offers greater skin tightening for the most refreshed look.